Of recent the bus world has been in a shambles full of ups, downs and rumours all over about mass exodus of bus companies staffs and the promotion of staffs to customers. The question is, what is really happening in the bus world? Is the effect of the SGR the main reason for such a mess or is the management of different bus companies a living nightmare? Well, personally i can't speak much of it. 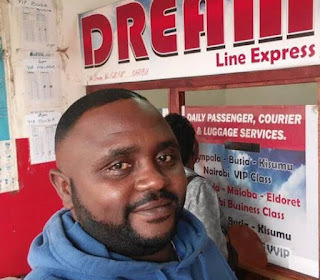 Now whats really shocking is the news reaching our desk that Senior Driver Harrison Gathii has left Dreamline for Buscar. Following his recent facebook post, the Senior Driver notified his friends and fans of his move from Dreamline to Buscar ltd. He also added that he had no issues with Dreamline management for being part of his decision to opt out of the company for Buscar. Harrison Gathii is one among the few Senior Drivers in the bus world. He is a renowned bus driver, a proffesional and experienced bus driver in the world of buses. I can say Harrison is the love of many and the pride of different bus companies in Kenya. His stay at Dreamline is at least 2 years while his last bus under dreamline is the KBR 393B bus. He was also a driver in Modern Coast, Nairobi bus, Eldoret Express among others bus companies. Well, we wish him the best of luck on his new adventure with Buscar ltd. Our message for him is to make Buscar ltd among the best and safest bus companies in Kenya.